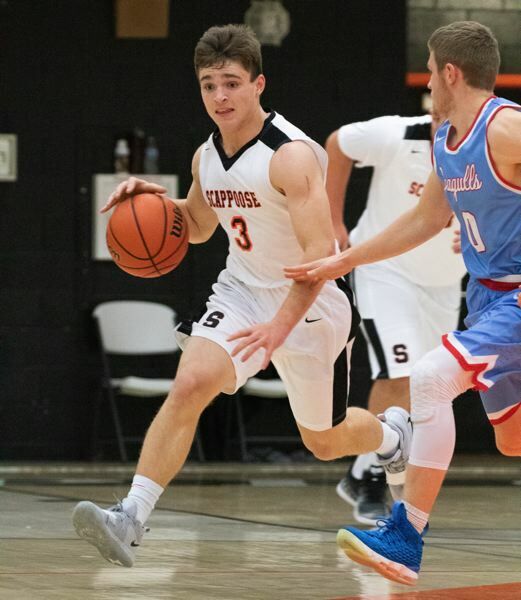 The Scappoose Indians went limping into the holiday boys basketball tournament. The Indians ended their December home schedule last Friday with a painful, in more ways than one, loss to Seaside. Starting point guard Connor McNabb went on late in the first half with a sprained left ankle, opening the door for the visiting Seagulls to pull away for an 83-52 victory. who were scheduled to play three games this week in the North Marion Tournament, starting with a Thursday night matchup with Scio. "I'm just really frustrated, because you can't help out the team when you're on the bench and can't play," McNabb said after watching the second half of the Seaside game with first ice and then tape around his injured ankle. The Indians were making a game of it for most of the first half. McNabb's assist to fellow senior guard Ian Johnson for a 3-pointer had Scappoose within 25-22 early in the second quarter. McNabb's ball handling helped the Indians do reasonably well against Seaside's full-court pressure, but when he went to the bench for a couple of short rest periods in the first half, his team struggled to get into its offense. And then with him sidelined by injury, the Indians had even more trouble breaking the press. "They turned us over in the backcourt. That was the biggest issue," said Scappoose's first-year coach, Matt Humphreys, whose team fell to 1-3. "Otherwise, I saw some stuff I really liked out of our kids. They played harder. They played with more courage on offense. "We've just got to take care of the ball better in the backcourt." That was sure to be one of the key areas of emphasis in practice this week, as the Indians prepared for this week's eight-team tourney. "Our seniors are going to have to toughen up and take care of the ball," Humphreys said. "There's no easy answer — Connor is one of our starters, and we've got to replace him, so those other guys have to step up and get tough." The Indians were tough, for much of the night against Seaside, when it came to battling for rebounds. "We competed on the boards. That was good," Humphreys said. "We've just got to box out a little better, all five guys. Too many possessions we had three guys blocking out instead of five." Seaside's victory lifted the Seagulls to 3-1. Humphreys said going into the game that the Indians would have to work hard to clamp down on Seaside's outside shooters. "I thought Connor did a great job early on his man, and Zack (Hafeman) did a very good job early, but he got in a little foul trouble," Humphreys said. "We let them get a little loose late, but some of that was in transition." Senior post Terrence Lewis led the Indians with 14 points against Seaside, nine of them coming in the fourth quarter. Senior Jaden Holmason, who did the lion's share of work trying to take McNabb's place, finished with seven points. "We played well in spurts," Humphreys said, "but if you want to beat a team like that, you've got to play well the whole game." Scappoose already was playing without two regulars in senior posts Gavin Larson (flu) and Konnor Nelson (concussion), McNabb noted, before he wound up on crutches for the night. His injury came with about 1:23 left in the second quarter on a transition play. "I should have gone for a pull-up jumper," McNabb said, "but instead I went up in the air and tried to make a pass (to Lewis under the basket). I ended up coming down on someone's foot and rolled my ankle. "It was really hard to watch (the second half)." There's never a good time for an injury, but Class 5A Northwest Oregon Conference play doesn't begin Jan. 8, with Hillsboro at Scappoose, and while McNabb is out other Indians will get more experience all around and especially against defensive pressure. "We'll do a good job of that," McNabb said. "Our guys pick up on stuff really well." Scappoose's three losses in the first two-plus weeks of the season were to Valley Catholic, Banks and Seaside — who were a combined 68-18 last season, with Seaside defeating Valley Catholic in the 4A championship game, after Valley Catholic edged Banks in the state semifinals. "We're losing to really good teams," McNabb said. "We'll learn from it and be fine." Humphreys tended to agree, with a couple of caveats. "I want us to keep competing on every possession," he said. "And I feel like we can find a way to take care of the ball, we're going to be OK."